Location: Home » ABSINTHE » SWISS ABSINTHE » ABSINTHE KÜBLER CUVEE.. In Switzerland, the production of absinthe from the 7th was October 1910 prohibited. Only at the first March 2005, the production of absinthe in Switzerland allowed again . To clearly acknowledge this historic ban on absinthe , Yves Kübler , who is the descendant of the company founder Mark Kübler Absinthe Kübler Cuvee du Centenaire created . So was distilled on 7 October 2010 at the Swiss Val- de -Travers where the distillery is located Kübler , 3000 bottles of this Absinthe Kübler Cuvee du Centenaire . Each bottle of this special bottling is marked with a historical production date and offered further in a very exclusive packaging. 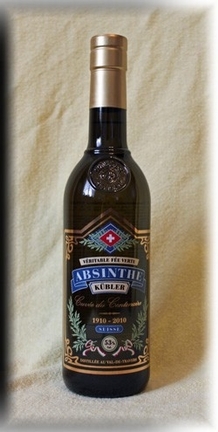 The Absinthe Kübler Cuvee du Centenaire is best diluted 1:5 with fresh spring water and is often enjoyed as an aperitif. If you like it sweeter, still takes a lump of sugar to it. Get your collectors bottle that may later have a very high value . Those who can not expect to enjoy the Absinthe Kübler Cuvee du Centenaire course immediately . That would not be surprising, since the distillery Kübler has long stood for quality. Here you can buy absinthe Kübler Cuvee du Centenaire in 0.5 l bottle in the jubilee anniversary bottle carton.